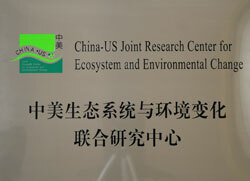 Through an initiative launched in July of 2006, scientists from the University of Tennessee (UT) and Oak Ridge National Laboratory (ORNL) have joined researchers from the Chinese Academy of Sciences (CAS) to establish the China-US Joint Research Center for Ecosystem and Environmental Change. The JRCEEC, which occupies research facilities at UT/ORNL and CAS, addresses the combined effects of climate change and human activities on regional and global ecosystems and explores technologies for restoration of degraded environments. Dr. Gary Sayler, Distinguished University Professor Emeritus in Microbiology and Adjunct Professor in BioSystems Engineering and Soil Science at UTIA, received the 2018 Distinguished Scientist “Einstein Professor” award from the Chinese Academy of Sciences (CAS) International Fellowship Program Initiative. The award was presented by Professor Guibin Jiang of CAS following Dr. Sayler's Plenary Lecture at the 1st International High-level Symposium on Toxicology and Health of Air Pollution in Beijing on October 21, 2018. Dr. Sayler presented a forward looking lecture on Climate Change relationships to the mobilization, transport and distribution of microorganisms and air toxins. Follow-on lectures were also presented at the CAS Institute for Applied Ecology in Shenyang, and the Research Center for Eco-Environmental Studies in Beijing, as well as the China National Medical University in Shenyang, Jilin University and Northeast Normal University in Changchun, where Dr. Sayler spoke on system science in bioremediation and the Lux bioluminescence sensor in environmental toxicology and health. FEWSTERN PROGRAM—A 2017 award from the US National Science Foundation to faculty and scientists at the University of Tennessee (UT) and Oak Ridge National Laboratory (ORNL) will support the development of a Research Coordination Network (RCN), designed to identify transdisciplinary research opportunities for scientists in the US and China focusing on the nexus of food, energy and water systems (FEWS). This grant, termed “Food-Energy-Water Systems Transdisciplinary Environmental Research Network (FEWSTERN),” will partner with three NSF-China awards to three teams of Chinese institutions, led by Nanjing University, South China University of Science and Technology, and Remin University of China, respectively, to develop research priorities transcending US and Chinese grand challenges. The Annual China-US Joint Symposium, "Advances in Critical Needs for the Nexus of Food, Energy and Water Systems," was held October 24-28, 2018 in Yixing, Jiangsu Province, China, at the Yixing Bamboo International Convention Center. A workshop on Modeling the Nexus of Food, Energy, and Water Systems was held July 19-22, 2018 in Beijing, China. A successful 2017 FEWSTERN Research Challenge Meeting was held December 7-9, 2017 at the Franklin Marriott Cool Springs, Franklin, TN USA. Take a look at the agenda with linked presentations.